Let’s play a little game of word association, shall we? What comes to mind when you think of the following words: deathtrap; decapitating; grenade-like; powder keg; and rolling sarcophagus? If your answer to any of these is “a car made by General Motors,” then an internal GM memo specifically banning the use of these words (and over fifty others) must have failed. 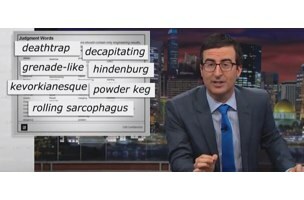 This past Sunday on HBO’s “Last Week Tonight,” John Oliver delivered a scathing breakdown of a decade’s worth of disturbing internal PR practices at GM, and then — as the final nail in the rolling sarcophagus — showed a pitch-perfect parody of a GM ad. And in case not enough people subscribe to HBO for this clip to contribute to the company’s already-sticky PR problem, the network has made the video available on YouTube (where it has already been watched almost 700,000 times). Just like in Shakespeare, the fool often speaks the truth more boldly and honestly than anyone else, and in this case, while viewers may be laughing (we certainly are), they are most definitely not laughing with GM.